Du Blonde is a multidisciplinary artist and musician, working with animation, illustration, sculpture, video, song writing and music production. Du Blonde, AKA Beth Houghton, is a multidisciplinary artist and musicians, working with animation, illustration, sculpture, video, song writing and music production. 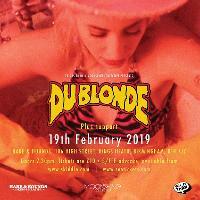 Catch her performing live at Hare & Hounds Kings Heath on Tuesday 19th February.